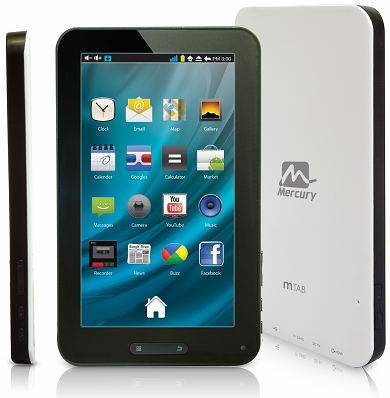 The mTab from Mercury comes with a 7-inch WVGA TFT LCD touch display powered by 1.2 GHz triple core processor with 512MB RAM. mTab runs on Android 2.3 Gingerbread OS and comes with 4GB internal storage and can be expanded upto 32GB. The mTab sports 1.3 megapixel front camera and it supports 3G and Wi-Fi 802.11b/g. Other options of mTab include G sensor screen rotation for 3D G-games, micro SD slot, supports all music and video formats. It comes with a standard 4000 mAh battery which is far better than any other Tablet in world market today which is able to play play videos for over four hours. The mTab has a dimension of 19.3 X 11.7 X 1.4 cm and weighs 400 grams. Currently Mercury mTab is available ex-stock in India with a price tag of Rs 9,499 and will hit the retail stores across the country in the first week of September. It is backed by one year warranty. Tags: Mercury Tablet mTab, Mercury mTab, mTab, tablets with triple core processor, tablets under 10,000.